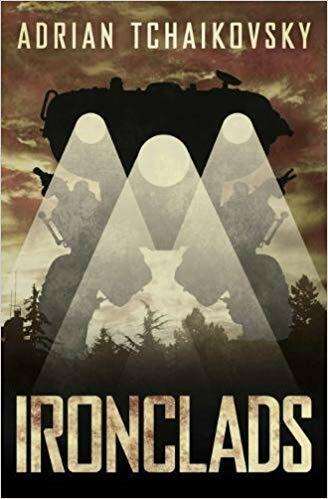 Ironclads provides a smart, sharp look at warfare in a near future that may not be, but feels like a funhouse mirror of the present that, like all good mirrors, shows us our present. Sergeant Ted Regan has been given a problem. In a futuristic battlefield where corporations and the rich war for fun and the poor participate just to survive, he has been given a task to solve an impossible situation. One of those rich, Jerome, one of the Scions, and his advanced mecha suit, an Ironclad, has gone missing in the wilds of Sweden. This is unprecedented and rather disconcerting to the powers that be. What can stop a Scion and their ironclad? Worse, for Regan, how can he and a motley group of his squad hope to find him and face something that take can apparently take out the best of the best? That is their impossible mission. This is the central plot problem of Adrian Tchaikovsky’s novella Ironclads, a story of a band of brothers in a future war run for profit and greed,, dodging enemy ironclads, mysterious agendas, betrayals, untrustworthy allies, and the fortunes of war. One of the signature things that I come to expect in a Adrian Tchaikovsky story is here only vestigally and that is unusual insects, mechanical or otherwise. Unusual mechanical insects are here, never fear, for fans of the author who come to expect insects in some capacity, but those insects are very much not the point here. Instead, the main technological and sociological focus in this novel is on the ironclads and it is here that Tchaikovsky unleashes his creativity. 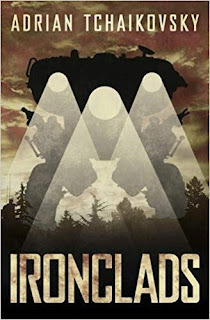 In the same way that, for example, Myke Cole’s medieval mecha or the magical mecha of the Exalted RPG verse expand mecha beyond their Robotech origins, so too, does Tchaikovsky in his own exploration of the concept of Ironclads. The idea of rich and powerful people getting to engage in war by means of being protected far more than average grunts like Sergeant Regan is explicitly, in the text, tied to dark age and medieval ideas of knights versus peasants The ironclad- using Scions are explicitly the new high class of warrior on the battlefield, showing how when war is a game for the rich, those who are not rich have to suffer and survive as best they can, outclassed from the start both in offensive firepower and defensive protection. The action beats and descriptions of surviving and travering in a blasted and dangerous landscape during wartime is expertly described. The titular Ironclads are not on screen as much as one might think, the author uses their presence with care. This is a story about the grunts, the common soldiers who have to survive in a war and do an impossible task with at best, unreliable allies with agendas all of their own.Regan and his team, a unit that has long standing set of relationships provide the core and a common shared set of relationships that get tested during the mission. There’s plenty of social and political commentary in the book. It’s a future world gone insanely corporate oriented, even as climate change has ravaged the globe. There are plenty of little jokes and references, the author clearly enjoyed his bon mots at taking trends and our present world and magnifying them into the future. The Prosperity Gospel of today, for example, gets turned into the ‘Church of Christ Libertarian’ in the novella. The funhouse mirror of his future corporate dominated world bitingly shows our present. And then there is Finland. Long ago, when reading Poul Anderson’s Boat of a Million Years, I was introduced to the idea of how many outsiders thought about Finland. One of the viewpoint characters, showing off his unusual skills to a dark age Dane, is constantly asked if he had learned the strange arts from the Finns. I grasped the idea that Finland to outsiders was a strange, unusual place with people speaking a very different language and customs. The term Scandinavia, for instance, most definitely *excludes* Finland from it’s purview. The strangeness and wonder of Finland infuses this slim volume. Even as the protagonists fight across the landscape of Sweden to complete their mission, the Finns they encounter (and the hints of the Finland they come from) are treated like an alien land with technology and power that’s a bit off, a bit different than everything else they are used to. There is more than a hint of a Faerieland quality to Finland and the Finns that the author leverages wonderfully into the novel. It complicates and enriches the worldbuilding and adds a new facet to the already storyline and economic and sociological questions that his future world poses. The unusual technology of the Finns vis a vis everyone else reminded me a bit of the technology one sees at work in Paul McAuley’s Fairyland. My only real criticism of the novella is a relatively minor one. Given the sheer invention and effusive worldbuilding, the excellent action beats, the social and political criticism and point of view that the novella explores, all of that does overshadow the characters a bit. This is not to say that Regan and his comrades are cardboard cutouts or just pieces on the chessboard of the great game, but their personalities and arcs are more than a bit overshadowed by all the other things going on here. It also should be said that readers who are not interested in Centrist and Left leaning (politically) Military Science Fiction, even one with biting social and political commentary such as this, will likely bounce off of this novella. Overall, though, that minor consideration is overshadowed by all the novella has to offer. Ironclads shows the power of Tchaikovsky’s writing, and continues to show his ever expanding range of interests and subgenres. Penalties : -1 for some weakness in character development and execution versus the other elements. -1 for some limitations of target audience for readers.